Discussion in 'Season 48' started by Phillip, Jan 20, 2018. Bert can't fall asleep because Ernie is making too much noise. Bert becomes angry and leaves with his bed in search of quiet place to nap. While they are apart, Bert and Ernie think about what they did and how it made the other feel. They apologize to each other and learn that even though they had a fight, they can still be friends. 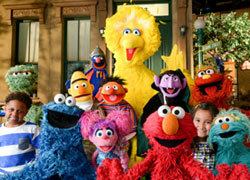 This episode features an all-new street story, Josh Groban singing "Hey Friend" and Elmo's World ("Friends"). If you saw "The Last Straw" please like this post and share your thoughts below. Probably the best street story of the season, I really liked it. And weird how E&B can see the subway from their window, even though Oscar's area would be blocking that window. "Hey Friend" was a little hard to follow musically and lyrically, but it's still really dam catchy and is probably my favorite song of the season so far. That Groban, whatta voice. And hey, two old Raposo songs in the episode. They should really remake more old stuff and keep the legacy going. I wonder why these were cut from their original aired episodes on HBO; maybe they couldn't negotiate something with Raposo's estate in time for them to start airing. For some reason the Ernie and Bert episodes often seem to be the better ones. When I saw that Josh Groban song listed in the press kit, my brain registered it as a remake of Bob's old song "Hi Friend". I gotta be honest, countless years ago, I actually had an idea for a street story like this, however, it was reversed: Ernie was the one who left the apartment with his bed, and not because he couldn't take a nap with Bert around, but because Bert got mad at him and wished he lived alone, which hurt Ernie's feelings, so he moves out so Bert can be happy living alone. Much like Bert in this episode, Ernie tried moving his bed to various different spots on the street, such as by Big Bird's nest, but Big Bird's snoring disturbed his trying to take a nap; he tries moving next to Oscar's can, but all the rotten food Oscar was eating was too smelly for him to tolerate; he tries moving into the Arbor, but there's too much activity going on (kids playing, grown-ups exercizing, people wanting to eat outdoors, etc.) that he's just plain in the way of. Finally, he moves to the roof of 123, where there's no snoring birds or smelly garbage to bother him, and no one trying to play for him to bother. As you can imagine, Bert feels guilty about what happened, and goes up to Ernie to apologize and ask him to move back in so they can still be friends. So, I really enjoyed this episode; I still think Ernie moving out would have been more believable and in-character for him - Bert moving out seems a bit impulsive for him, not to mention, much like his birthday episode from 2003, I can imagine how happy he'd be to have the apartment to himself at first, but slowly growing to release how strange and empty it seems without Ernie. Speaking of which, I see how Ernie and Bert's apartment has undergone some subtle remodeling with the paneling around the lower half of their walls. The only other things I have to comment on is the nice "Somebody Come and Play" short, and I'll agree, Josh Groban's song was catchy. And, I'm glad to see they're still taking the time to count the individual cookies during NOTD. Little disappointed we got a Murray Newsflash instead one of any of the three Cookie Monster segments, but eh, that's only a quibble. And am I imagining things, or haven't we seen that cold opening teaser with Elmo about friendship before? The cold open with Elmo was used twice before. This episode was very good, it was the first time since 2010 we've seen Bert and Ernie's apartment, there were funny moments like Big Bird being able to move Bert's bed with no problem, the When Harry Met Sally reference, and the sheep saying multiple baas but it only means one word. The Josh Groban song was very catchy. Who voiced Big Bird in this episode??? Actually there was a ss book exactly like that, that came out in 83. It was called Ernie's big mess. I had a book and record of it when I was a kid. I agree. Nice expansion on the plot where Bert is trying to sleep and Ernie keeps waking him up, very reminiscent of the days of Jim and Frank playing the characters. Now that was Matt who voiced Big Bird in this one? I thought it was Carroll just sounding different because of his dystonia. I have heard that Matt would record new material for season 48, but does this mean that Carroll has retired altogether? Does this mean that Carroll has retired. So far Matt and Eric have been the only ones doing the voices this season. Oh, is Carroll still in the closing credits though? Right now I can only watch the eps online and they only include the street scenes. 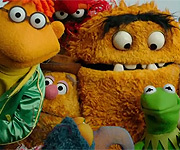 I think Muppet Wiki does still credit Carroll as BB and Oscar, so he might be heard in a scene or two this season. You never know. @Daffyfan2003 What website do you find the episodes on? There are actually some episodes on YT. Evelyn Breit uploads street scenes, while Alonso Espinoza uploads full episodes. Hey, is your name Daffyfan? Lol. JK. But I only saw on full ep that was on YT so far. Maybe just as well, with how busy I've been lately I only have time for the ten minute street scenes, plus I don't want to see to my spoilers before they air on PBS. "The Last Straw" premieres on PBS this Monday February 11. Tune in and let us know your thoughts. Rovi (one of the two companies that reports guide data in the US) is showing this as Season 48 Episode 9. We believe this is a numerical mistake. Gracenote (the other company that reports guide data) is showing this as Season 48 Episode 10 which is what we believe will air. I learned why Josh Groban's song was so catchy: It was composed by Matthew Sklar. Broadway composers seem to put the most effort into Sesame songs these days, even when it's a street story song where the lyrics and music were written separately.